One of my favorite stamp sets in the BIG catalog is from last year...Christmas Lodge. I love all the images in this set. Couldn't resist adding glitter to the roof to look like snow. Ya think they are related??? Here is a cute picture of my husband and son, Steven, at the 4-H fair this year. They rule the Remote Control Airplane Club! I am glad they have this hobby to share together. I am sure you have seen these stars this season, they are made with the Ornament Keepsakes and matching framelit. I will worn you, this project can be time consuming cutting out all the ornaments with the Big Shot. This would be pretty as a package decoration or on the tree. A closer look reveals that the star has been spritzed with shimmer paint and alcohol mix. We made this card in my downline meeting. Love all the texture. The one leaf is stamped with Wonderfall, cut with Autumn Accents die. More color is sponged on the edges, spritz with water, crumble up leaf, smooth out and then add a little Early Espresso ink on the top. Every leaf turns out different, just like in nature. Lots of product on this card. Let me know if you have any questions. For this card, I let the Candlelight Christmas fabric determine the color scheme: Lucky Limeade and Early Espresso. Gotta love the coordinating framelits for Scentsational Season. Oh, see the paper piercing...haven't done that in awhile. Those Kraft boxes in the catty are great for a lot of things. This sample is a portion of the M&T from convention. The bow on top is make from cardstock and a vintage faceted button (pearl in the middle). The 3x3 card uses Daydream Medallions stamped in Midnight Muse and Summer Starfruit, with sentiment in Primrose Petals. Do you see the polka-dots on the box? They are created using the left-over centers of the flowers from the Daydream Medallion set, stamped in VersaMark. Love that! 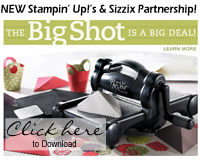 While the kids are heading back to school, Stampin' Up! is going back to 'spool'! 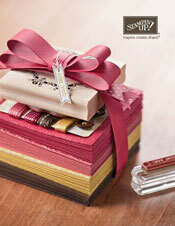 For the month of September, get a FREE package of 3/8" Stitched Satin Ribbon-an $8.95 value-for every $40 you spend! Choose from any of the ribbons below. Also check out the funny video with some ideas of what to do with all your free ribbon.